Announcement of Bomb Threat Hoax - Please Read. 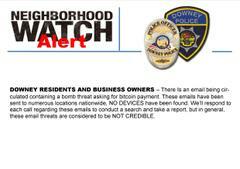 DOWNEY RESIDENTS AND BUSINESS OWNERS – There Is an email being circulated containing a bomb threat asking for bitcoin payment. These emails have been sent to numerous locations nationwide, NO DEVICES have been found. We’ll respond to each call regarding these emails to conduct a search and take a report, but in general, these email threats are considered to be NOT CREDIBLE.